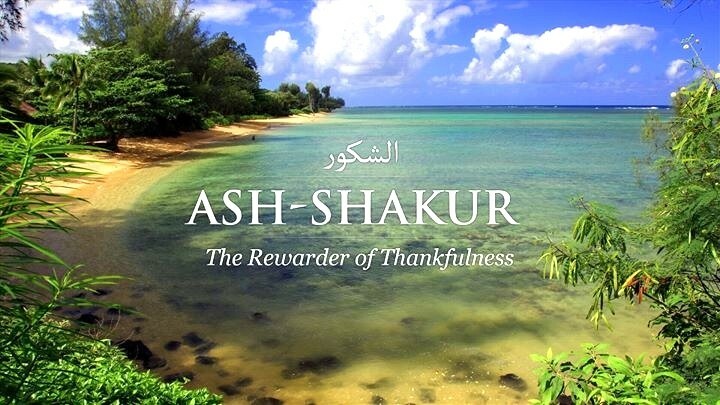 and this is what Allah’s beautiful divine name “Ash-Shakour” (The Most Appreciative) denotes. In Arabic, the word “Shakour” (Most Appreciative) is an emphatic name that is derived from the word “Shakara” (to thank); and whenever emphatic names are attributed to God, they emphasize either quantity or quality. How Allah is Shakour (Most Appreciative)? 1- As to quality, Allah the Most Appreciative grants His righteous slaves infinite happiness in the Hereafter in return for a limited number of years of devotion and dutifulness on their part in this present world. Apropos that, you have to remember that any number, no matter how great it might be, is nothing if compared to infinity. In other words, if you live for a limited number of years during which you obey God, suppress you lusty desires and caprices, perform righteous good deeds, earn an honest living, attend religious lectures, read and understand the Quran, call for Allah and His religion, spend your money for the cause of Allah and His religion, all of this is nothing compared to Allah’s infinite recompense and reward. This means that He gives too much in return for too little. Thus, Allah “Ash-Shakour” gives that which is infinite in reward for man’s limited good righteous work that he does in his short-termed human life. To this effect, Abu Hurairah, may Allah be pleased with him, quoted prophet Mohammad, peace be upon him, as saying: “Allah, All Mighty, says, ‘I have prepared for My righteous slaves good things that no human eye has ever seen, no human ear has ever heard of, and no human mind has ever thought of.’” [Sahih Al-Bukhari] To this effect Allah says: “And when you look there (in Paradise), you see bliss and a great kingdom.” (Al-Insan 76: 20). God calls that which He has prepared in paradise for His righteous slaves “a great kingdom”. Allah “Ash-Shakour” (the Most Appreciative) most generously grants you something priceless for something little you offer to Him. 2- The quantitative meaning of Allah’s name “Ash-Shakour” (the Most Appreciative) is that whatever good and righteous things you do for the sake of Allah; He thanks you and rewards you for them. Allah is Most Appreciative that if you do well, He, most generously rewards you; and if you praise Him and speak well of Him, He makes people praise you and speak well of you. Hence, He, the All Knowing, knows all the good things that you do. If you rescue a butterfly, if you have mercy on someone, if you secure someone frightened, if you calm down the feelings of someone anxious, if you reassure someone worried, or if you feed someone hungry, it will be kept preserved with Allah, Most Appreciative, for you, no matter how numerous the good things that you do are. 3- Linguistically, the word “Shakour” is derived from the Arabic word “Ash-Shukr”, which means “increase”. In Arabic, someone is said to be “Shakeer” if he has young children; a tree is said to be “Shakeerah” if it has originally grown from small stalks; a female camel is said to be “Shakeerah” and “Shakra” if she has a full udder; a piece of land is said to be “Shakeerah” if it has a lot of plants; an animal is said to be “Shakour” if it grows more than the fodder it is given; and a plant is said to be “Shakour” if it needs only little water. 4- If man obeys his Lord and the Lord rewards him for such obedience, this means that the Lord thanks him. So how would it be with Allah’s due reward to His slaves on the Day of Judgment? Undoubtedly, Allah is Most Appreciative! Divine Appreciativeness as manifested by reward means that if you do righteous good deeds, yours will be Paradise. You spend of your time, experience, or knowledge, you help other fellow humans, you are sincere and honest, you do your work properly, and you deal with other people honestly and faithfully: this means that you do the minimum, just like when you have a certain job and you do it properly, getting a reasonable wage in return. In other words, the minimum thing to do is to do good to other people, one way or another. “Ash-Shukr” (Appreciativeness) of a human being is of two kinds; verbal and virtual, neither of which can be achieved except by knowledge, which is the essence of Appreciativeness as you cannot be Appreciative unless you know. Virtual Appreciativeness, which is manifested by practical work, can be made clear by the following example: Someone grants you a house or does you a great favor. When you see his little son in the street, you offer him some sweats to eat. This is a kind of Appreciativeness to the father. Therefore, when a true believer does favors to other fellow humans; has mercy on them, honors them, secures them, provides them with food and drink, provides them with clothes, when he is compassionate to them, or when he does a favor to any creature, whatever it might be, a cat or a small dog for example, this means that he is Appreciative (Thankful) to God. God creates favors and bestows them upon you, either directly or by means of another fellow human, whom He gives such favors, inspires and enables to offer to you. How a favor of Allah differentiates from that of a fellow human? 1- You may need something and ask someone to offer such thing to you, but he may be in need of it and, therefore, cannot give you such thing. But Allah is Self-Sufficient and free from all needs. Therefore, when you ask Him for anything, He gives it to you most easily. This is the first point of difference. 2- More importantly, a fellow human may be able to give you something, but he may not be available when you need him. He may be somewhere else and, therefore, cannot offer you such thing. But Allah is always with you wherever you are and this is the second point of difference. 4- Moreover, if a human gives you or lends something, he may very often remind you, either privately or publicly, of such thing. Also, a human being may fail to do you a favor because he is unable to do so or he is not available and, therefore, cannot be reached. Also, if you fail to be Appreciative enough to a human being who does you a favor, he may withhold such favor from you or boastfully remind you of such favor. This is by no means the case with God, the most generous and most Appreciative. The Appreciative then is God who gives most generously. When Allah is obeyed, even though inadequately, He accepts; He accepts that which is little and gives much in return. He accepts good deeds of obedience, even though only a few, and repays most generously. That is why it has been rightly said: Reality of Appreciativeness is to see the benefactor through His benefactions.